The trouble with democracy... - Miata Turbo Forum - Boost cars, acquire cats. It's taken for granted by many that democracy is best, and that the USA is supposed to be one. The political debates all center around "the gov't should do this, do that", which is really about the majority (or sometimes minority), imposing its will on everyone else. You can see the circus that is the RNC and the DNC. This is supposed to be "the will of the people"? We should all question the very idea of democracy wherein on every issue of our lives the majority set the rules. The problem is that on many issues, each of us is in the minority. 51% think ultralow speed limits are good? 55 mph limits! 51% think marijuana is bad? Jail for users! And so on. You have to ask, why does the majority have to rule over the minority on every issue? In just 97 pages they debunk 13 great myths with which democracy is usually defended. What is more, they offer an appealing alternative: a society based on individual freedom and voluntary social relations. The problem I have with democracy is that the majority of voters are too worried about "liking" stuff on facebook. I call these people "the blind", because to them, the presidential election is just another episode of American idol. I love it when people like this reply with "I vote because it's my right as an American". So is lighting yourself on fire...it doesn't mean it's a good idea. Chicago teachers have the highest average salary of any city at $76,000 a year before benefits. The average family in the city only earns $47,000 a year. Yet the teachers rejected a 16 percent salary increase over four years at a time when most families are not getting any raises or are looking for work. Just 15 percent of fourth graders are proficient in reading and only 56 percent of students who enter their freshman year of high school wind up graduating. Maybe I suggest a book for you Joe? 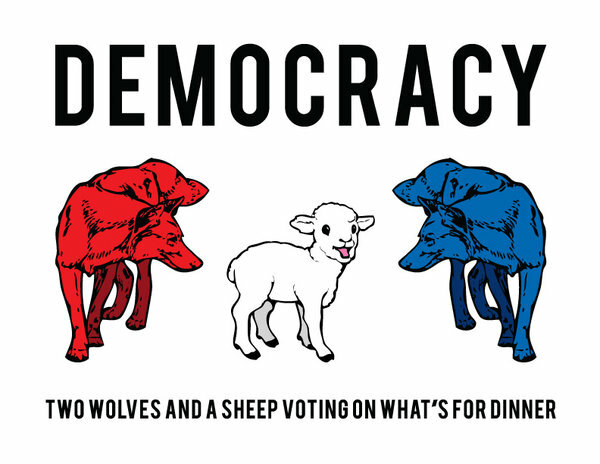 Democracy is mob-ocracy. As many here have noted, the mob is ill-informed and easily propagandized, by the people in power, no less. So democracy degenerates into rule by the ruling elite. Unfortunately, our constitutional representative republic is devolving into a democracy. Democracy is the antithesis of individual rights. It is something to be feared. And it has been pushed in that direction by certain ideological groups from shortly after the inception of the Constitution. The progressives pushed the Seventeenth Amendment to the US Constitution through under Woodrow Wilson in 1913, thereby stripping the state legislatures of their voice in Congress. This devolved the bi-cameral Congress into two groups beholden to essentially the same constituent body, the mob of open majority, as opposed to one house of Congress being elected as representatives of the people and the other house of Congress being appointed to serve the interests of the state legislatures. This move to usurp the federal government's accountability to the various states was part of the progressives' plan to further undermine states' rights and push toward mob rule. IB4 Bob calls you a facist. Watts said the strike had messed her day up and forced her to stay away from her temporary job as a machinist so that she could pick up her daughter, Trinity, and son, Jayvon, when the school closes early at 12:30 p.m. Still, Watts blamed the mayor, not the teachers. The moment you pay $5,000 in taxes (less receipts from government), you get another vote. So someone who pays $175,000 in total TAXES MINUS RECEIPTS gets 7 votes. It's genious I tell you. The masses still have the power to overwhelm the wealthy, but it becomes much harder when the high income earners have much more say over where there money goes than the low income earners. We are a Liberal Democracy. The definition of which is a Democracy with Safeguards and rules in place for the preservation of human rights and civil liberties from the tyranny of the masses as might be found in a direct democracy. I will leave out Republic because I think the concept of Republic which also describes us because of our states rights does next to nothing to preserve liberty and more often preserves tyranny such as it tried to do with slavery for instance. After all The Peoples Republic of China, and The United Soviet Socialist Republic are also republics. It's not like it is a concept of our government to be proud of for it's awsomness. lol. Have you not been paying attention to politics lately? The wealthy in this nation are in no danger of not having their views represented. Wait, what? I didn't even post in this thread. This isnt a democracy, its a republic. Im glad this isnt a democracy or we would be even more fucked, which is an impressive level of fucked considering how ******* fucked we ******* are. While we are indeed a republic the term doesn’t come close to describing our form of government. By definition, republic simply means we don’t have a monarch and government is considered a "public matter" (Latin: res publica), The Type of republic we are is a Liberal Democracy. Republics can also be socialist and not have safeguards for liberty and civil rights again Russia and China are also republics. I prefer living in a republic that is a liberal democracy. Lol at Russia and China being Republics. That's your worst argument to date Bob, but as always, the laugh factor is very very high on the BBundy scale of fun. That's like saying the Supreme Being of Iran has declared himself a Unicracy. The People's Republic of China, the former Union of Soviet Socialist Republics, and the former German Democratic Republic have one important overriding common feature, one party rule. When one party controls all aspects of a government those controlling the party have all of the power, and the rule of law is most often the first casualty (see: Franklin Roosevelt). Constitutional Republic - Rule by a government whose powers are limited by law or a formal constitution, and conducted by representatives chosen by a vote amongst at least some sections of the populace (Ancient Sparta was in its own terms a republic, though most inhabitants were disenfranchised. The United States is a federal republic). Democracy - A form of government characterized by the direct vote of the populace for the adoption of laws and policies. So Bob, do we elect representatives to vote on our behalf or do we as a citizenry vote for the adoption or refutation every law ourselves? Benjamin Franklin, leaving Philadelphia’s constitutional convention in 1787, was approached by a woman who wanted to know what type of government the delegates created. So don't argue with me, argue with Ben. acutally, we might as well be considered a liberal democracy now, if you look at it objectively. But those who believe the US is such, also believe that the American and French Revolutions share common ground, which is silly beyond comprehension. The Communist Party controls everything. That's the anti-republic. China is a RINO; Republic in name only. I meant Jason. I'm bad at names. We are not a "Democracy" we are a "Liberal Democracy" There is a Difference. Republic is way too broad of term to describe our government. Liberal Democracies typically are Republics that have safeguards to protect individual Liberty of the few from the Tyranny of the masses as with a direct democracy. A representative form of democracy is one of those safeguards, a constitution with a bill of rights is another, along with rule of law, seperation of powers, etc. It seems to me many on the right want to go back to the Dark Ages for their form of government. No real central government and feudal lords who in owning all the capital are able to dictate terms of employment and access to societal things we take for granted like infrastructure, education, and social safety nets. And it is also interesting they like to use irrational religion to control peoples behavior and make laws. Last edited by bbundy; 09-11-2012 at 12:18 PM.